OSWEGO – The 450 employees from affiliate’s St. Luke Health Services, Bishop’s Commons and Michaud Residential Health Services had the chance to participate in a Wellness Fair which took place recently at St. Luke in Oswego. The Wellness Fair offered staff a wide range of information about issues affecting health and well-being. 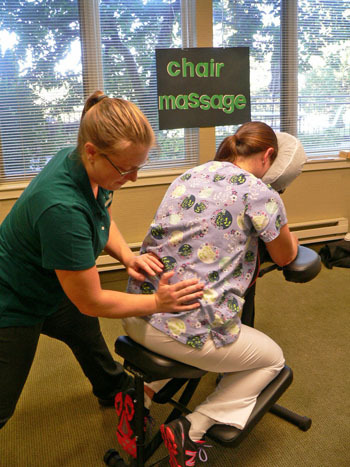 Pictured at the annual Wellness Fair held recently for all employees of affiliate organizations St. Luke Health Services, Bishop’s Commons and Michaud Residential Health Services is Nurse Lindsey Demling; as she receives a chair massage from Jes Diters, LMT, of Manipulations Massage Therapy in Oswego. Demonstrations, screenings and samples from area businesses and service providers made for an informative and enjoyable event. Informational booths covered a wide variety of topics, including Diabetes Education by Novo Nordisc, emergency preparedness by Oswego County Health Department, smoking cessation by Blue Cross/Blue Shield, Nutritious Smoothies by J and J, Food tasting by Sodexo, Food Safety by Cornell Co-operative Extension, personal financial management from the Yost Group, dental care by Dr. Bozak, and EEE virus awareness and protection strategies from the Office of NYS Senator Patty Ritchie. Staff got to take part in a number of activities including Zumba classes, Facials by Mary Kay, personal fitness evaluations by the SUNY Oswego Fitness Center, chair massages by Manipulations, and blood pressure, bone density and cholesterol screenings provided by St. Luke’s RN staff, along with plenty of useful product samples and taste testing healthy food choices with St. Luke’s own Food and Nutrition Department. Affiliates include St. Luke Health Services, Bishop’s Commons Enriched Living Residence in Oswego, and Michaud Residential Health Services in Fulton. Together we provide care and services to more than 350 people and together we employ more than 470 in our community.